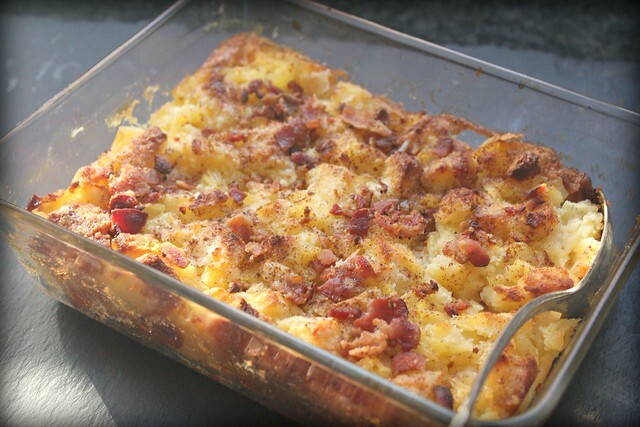 Trust me with this one... if you like pineapple upside down cake... you will absolutely love this pineapple stuffing with crispy bacon! The bacon was not added to this dish to be gimmicky...the touch of crisp, saltiness truly adds to the overall taste of the dish! A traditionalist at heart, I wouldn't serve this as my only stuffing on Thanksgiving day, but as a side dish option (perfect with turkey or ham) it's a welcome surprise to the typical spread! *I used Pepperidge Farm white sandwich bread in this recipe...it works well in a stuffing.